Makes what you might think were mundane topics interesting. Bad (awesome) puns delivered in a perfectly dry voice by the host, Flora, are the icing on this fact cake. 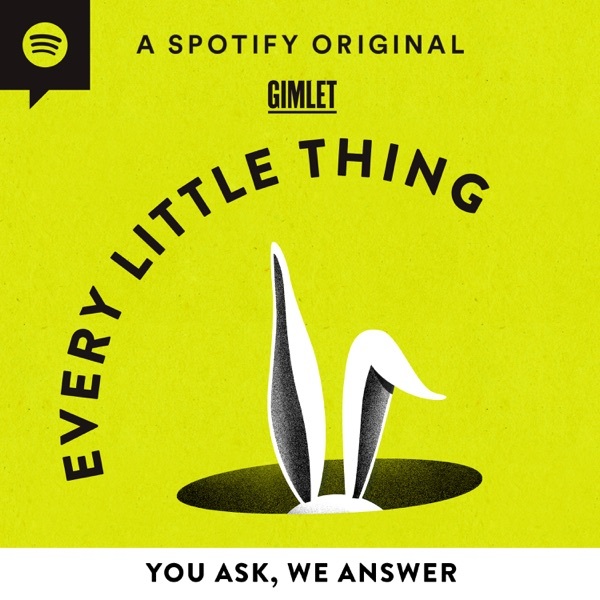 ELT introduces The Cut on Tuesdays, a new Gimlet Media podcast hosted by Molly Fischer. In this episode, chefs Samin Nosrat, Angela Dimayuga, and Carla Lalli Music do their best to help Madeleine Aggeler -- the Cut's semi-competent food columnist -- throw a dinner party for her friends. Can duct tape really fix every little thing? ELT tests the limits — and gets to the bottom of a duct tape story that’ll blow your socks off. Plus, your most ingenious MacGyver stories. <br><br>Guests: Daniel Munson, Senior Product Development Specialist at&nbsp;<a href="https://www.3m.com/">3M</a>; <a href="http://www.garylarose.com/">Gary LaRose</a>, lodge owner and hunting guide on the Alaska Peninsula; <a href="https://www.fly907.com/about">Luke Miller</a>, Anchorage-based pilot and guide. Thanks to callers Ian, Hunter, David, Whitney, Leanne, Stacie, Elena, Diana, Ashley, Lauren, Lucy —&nbsp; and to all the listeners who shared their MacGyver stories.<br><br>Got a burning question of your own? Call 833-RING-ELT. When did organ music and baseball become a thing? ELT talks to some pro organ players to find out how organs and ballparks got together. Plus, meet Nancy Faust — the legendary organist who brought trolling to modern baseball music.<br><br>Guests: <a href="http://www.stevenball.com/bio.html">Steven Ball</a>, organist and Director of Sacred Music at The Oratory of St. Francis de Sales in St. Louis, Missouri; <a href="https://twitter.com/jtkantor?lang=en">Josh Kantor</a>, organist for the Boston Red Sox; Nancy Faust, retired organist for the Chicago White Sox<br><br>Thanks to caller Robert. Thanks also to Judy Scott.<br><br>You can see a photo of Nancy's donkeys on our <a href="https://twitter.com/eltshow">twitter feed</a>. ELT gets to the bottom of a familiar aroma -- thrift store smell. Why do thrift shops all smell the same? Plus, is washing your clothes better than freezing them? ELT investigates listener cleanspiracies with expert cleaner Jolie Kerr. <br>Guest: Jolie Kerr, writer and host of <a href="https://itunes.apple.com/us/podcast/ask-a-clean-person/id996183661"><em style="background-color: highlight;">Ask a Clean Person.</em></a> Thanks to callers Theresa, Rachel, Jeremiah, Nikki, Vicki, Mark, Juliana, Ben and all the listeners who called in with cleanspiracies. One eerie sound has been haunting Hollywood movies — from <em>Poltergeist </em>to <em>Jurassic Park </em>to <em>Let the Right One In</em> — and 14 seasons of <em>Unsolved Mysteries</em>. ELT tracks down the source of the scary sound.<br>Guests: Rayme Waters, daughter of the spookiest sound in Hollywood’s inventor; percussionist Emil Richards; composer <a href="http://www.wisdomoftheworld.com/gary-malkin/">Gary Malkin</a>.<br>Thanks to caller Marianna. Thanks also to <a href="http://waterphone.digiprolocal.com/">Brooks Hubbert</a>, who runs the waterphone business, and musician <a href="https://gravityadjustersexpansionband.bandcamp.com/releases">Lee Charlton</a>. How did cold uncooked eggs become a festive beverage? Plus, coquito for the nogged out. And one of the first scientists to hoist herself into the treetops describes life in the canopy.&nbsp; <br><br>Guests: <br><br>Chef and food writer <a href="https://www.seriouseats.com/editors/j-kenji-lopez-alt">J. Kenji López-Alt</a>; Chef and <a href="https://thenoshery.com/">Noshery.com</a> founder <a href="https://thenoshery.com/about/">Meseidy Rivera</a>. You can find Kenji’s eggnog recipe <a href="https://www.seriouseats.com/recipes/2011/12/rich-and-frothy-holiday-eggnog-with-an-electric-mixer-or-stand-mixer.html">here</a> and Meseidy’s coquito recipe <a href="https://thenoshery.com/coquito-puerto-rican-coconut-nog/">here</a>. <br><br>Biologist <a href="https://canopymeg.com/">Meg Lowman</a>, Director of Global Initiatives, Lindsay Chair of Botany &amp; Senior Scientist in Plant Conservation at the <a href="http://www.calacademy.org/staff/ibss/margaret-d-meg-lowman">California Academy of Sciences</a>. Tucked into your car’s dashboard is a tiny arrow that points to the side of the car with the gas tank cap. Who came up with it? ELT tracks down the inventor of this tiny, brilliant car hack. Plus, do you really need to warm up your car?<br><br>Guests: Automobile aficionado Jason Torchinsky of<a href="https://jalopnik.com/tag/jason-drives"> Jalopnik</a>; gas tank-indicator arrow inventor Jim Moylan. Thanks to caller Jonathan, the listeners who shared their car-spiracies, and the car experts who answered our questions.<br><br>Have a tiny but important invention you want to know more about? Tell us who belongs on ELT’s Bulletin Board of Glory™. Email us at elt@gimletmedia.com. WTF Do the ⏹  ⏺ on My  Tag Mean? How they get that tunnel under there. Plus, a centuries-old scientific debate: why ice is slippery.<br><br>Guests: <a href="http://www.drmoleinc.com/mobile-about%20gary.html"><strong>Dr. Gary Brierley</strong></a> <strong>(aka Dr. Mole)</strong>, tunnel engineer, <a href="http://stm.lbl.gov/Salmeron_group/new_php/index.php"><strong>Dr. Miquel Salmeron</strong></a>, physicist at Lawrence Berkeley National Laboratory, Special thanks to callers Nikki and Erin.<br><br>Check out the <a href="https://www.youtube.com/watch?v=z38JIqGDZVU">Terrifying Tunnel Video</a> referenced in today's show. We're hard at work on Season 2 of ELT. In the meantime, we thought you'd enjoy this brand new Gimlet podcast called The Pitch. On it, real entrepreneurs pitch to real investors for real money. It's high stakes and nerve-racking and really fun. We're sharing episode 2, iMirror, on which a startup founder pitches his plan to disrupt the hotel industry by changing what happens when we look in the mirror. If you enjoy it, make sure you <a href="https://itunes.apple.com/us/podcast/the-pitch/id1008577710?mt=2">subscribe</a> wherever you get podcasts.